After Tour Down Harder Contest, the second contest will be about the winter stage races. What are the two most famous winter stace races? Of course the Paris - Nice and the Tirreno - Adriatico. - You had to take into account that race are settled in early march, so, for example, there is snow limit. You have to avoid high altitudes. You cannot go above 1700 meters in French stages and 1800 meters in Italian stages. Is there a resting day in between the French stages and the Italian stages for a longer transfer? Nope. I wanted to give it in first instance, but not giving it should make the contest more interesting. Hi! Can you explain better the dates of this race? because the 2nd, the 8th and the 14th can't be all Wednesday, so there should be a mistake or I didn't understand what you mean. 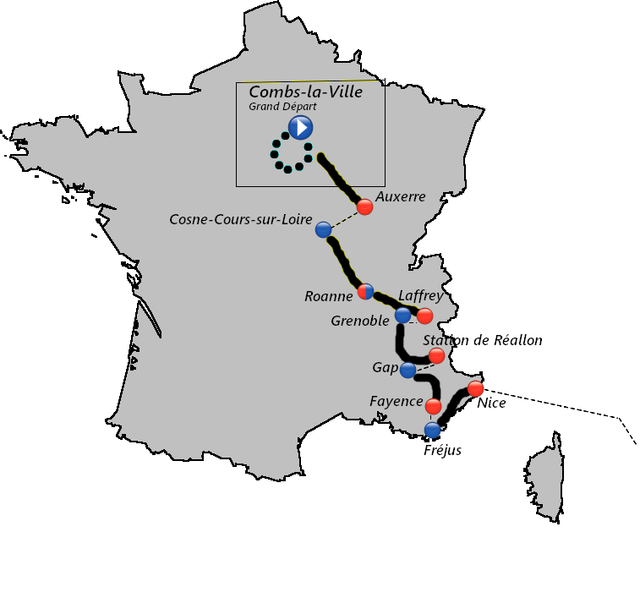 It starts at Combs-la-Ville (near to Paris) and ends at Monopoli (on Adriatico). The french climax is the Réallon Station at 1544 m above sea level and the italian climax is the rifugio Sibilla at 1541 m above sea level. The first seven stages are in France and end at Nice with the last climb of the stage the Col d'Eze. The next six stages are in Italy and start at Portoferraio on Elba Island (Tyrrhenian Sea). This tour is composed of two ITTs (33,4 km total), 4 plain stages, 4 medium mountain stages and 3 hilly stages. The tour has a total of 2134 km. 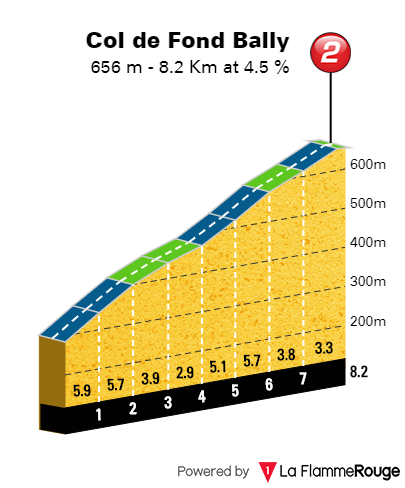 This stage ends at the Rampe de Laffrey, a very hard climb (6,8 km at 9,4 %). This is the first opportunity for climbers to win and maybe to get time on others. 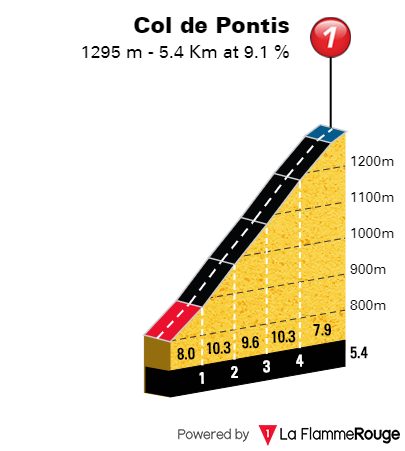 The Col de Pontis can make lots of damages in the peloton and can tire the leaders for the last climb. This stage is really difficult with a lot of climbs (Col d'Eze, Col de Châteauneuf, etc...). It will be very hard for riders. This TT is very very hard. 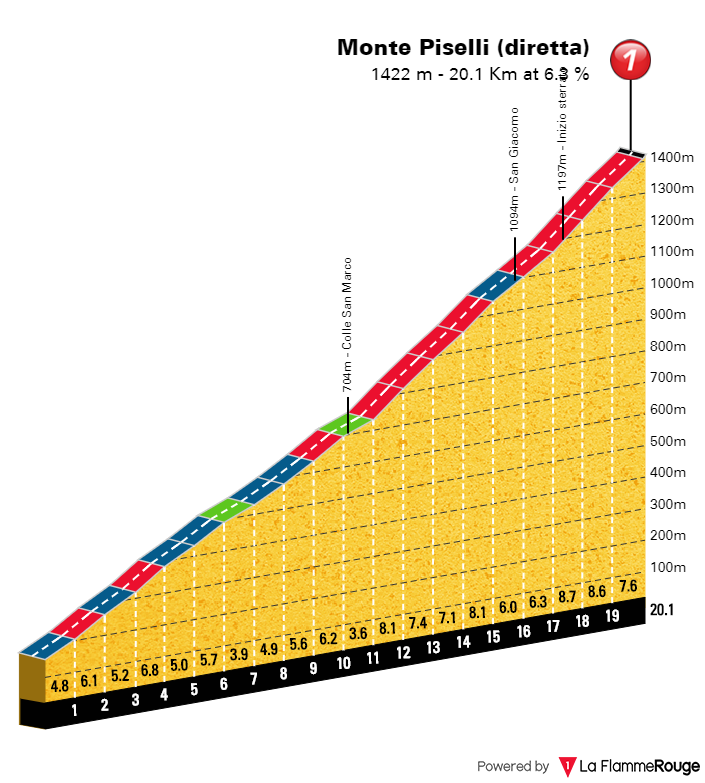 The Monte Perone is a 9,4 km long climb at 6,6 %. 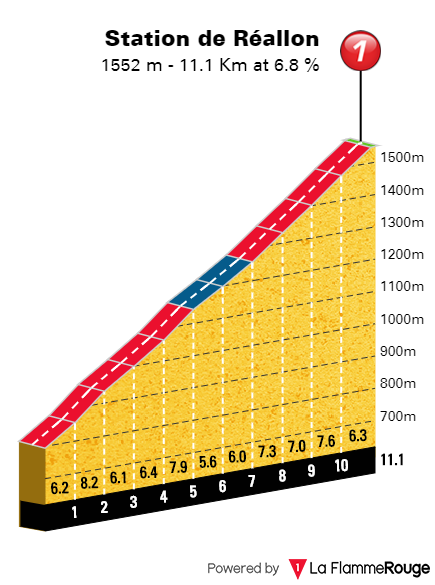 This stage is very hard because of the succession of climbs. The road of the last climb is not asphalted with white gravel. Last edited by Alfa on 14/02/2018, 13:35, edited 4 times in total. Please use the same stage style for all the route. it starts in Thoiry, small city in the west hinterland on Paris, famous for his zoological park and ends in San Benedetto del Tronto. 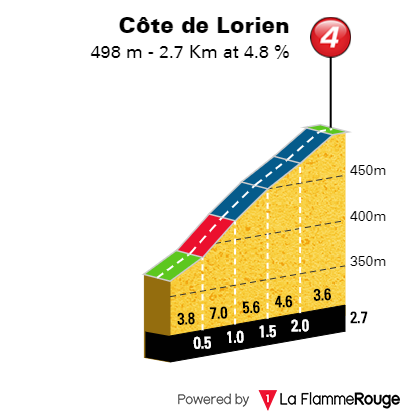 stage 1 is a sprinter stage: mainly flat, but 3 small cotes near the end can cut off some sprinters from the victory. 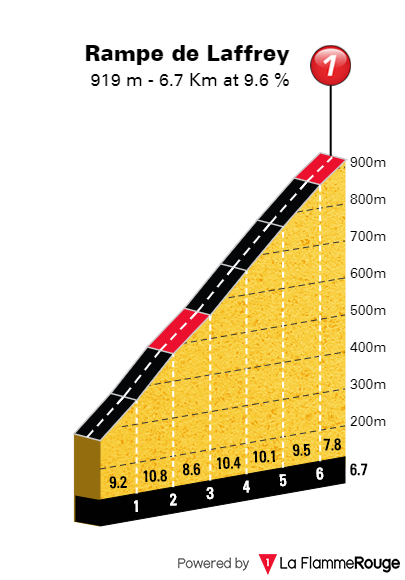 stage 2 is very hilly in the central part (breakaway chance ?) and a small ascent that ends at -1km can be a factor in the stage. stage 3 is a flat, sprinters stage. stage 4 is a tricky stage with a climb near the end of the stage. the favourites have to pay attention. stage 5 is a flat ITT long 24km, that can create some huge differences between the GC favourites. 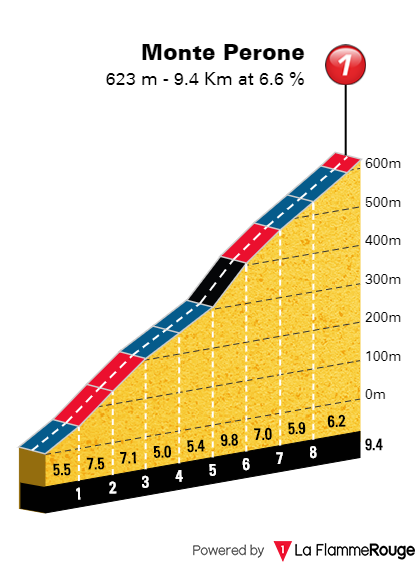 stage 6 is the main stage in france section: 5 medium-difficulty climbs before the end in Pra Loup (7.7km at 6,5%). its one of the key stages. 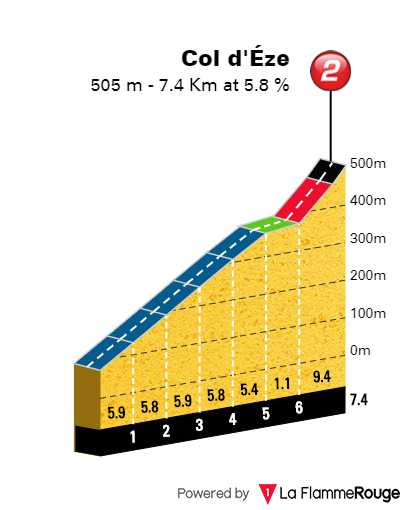 stage 7 is very hilly, with 6 small climbs (the penultimate is the Eze) before the end in Nice. stage 8 covers all the Liguria Coast from Nice to Genova, where starts the small climb of Marassi (2,7km at 5%) that can help finisseurs. stage 9 is flat, with a sprint as the most probably end. stage 10 is a hilly stage with some climbs in the center and no real flat before the last 40kms. breakaway has a lot of chances here. stage 11 is the second and last ITT, with the climb in white road of Alpe di Poti (10.2km at 6,1%). key stage. stage 12 is the last mountain stage, with 7 medium - hard climbs before the last ascent to Poggio di San Romualdo (10.4 km at 6,6%, with max slope at 11%). Last edited by simone.galbiati on 16/02/2018, 10:42, edited 1 time in total. The race tries to respect as much as possible the original track of both races. The difficulties are equally divided between France and Italy, being understood that the decisive and hardest stages will be located in the last week in Italy. The transfers have been reduced to the minimum since it’s a 13 days race without a rest day. Overall there are 4 flat stages, 3 rambling stages, 2 medium mountain stages, 2 time trials and 2 high mountain stages. 4 uphill arrivals. Maximum altitude in France 1417 mt. (La Font d’Urle). In Italy 1645 mt. (Monte Catria). The first 6 stages are entirely in France, the last 6 entirely in Italy. 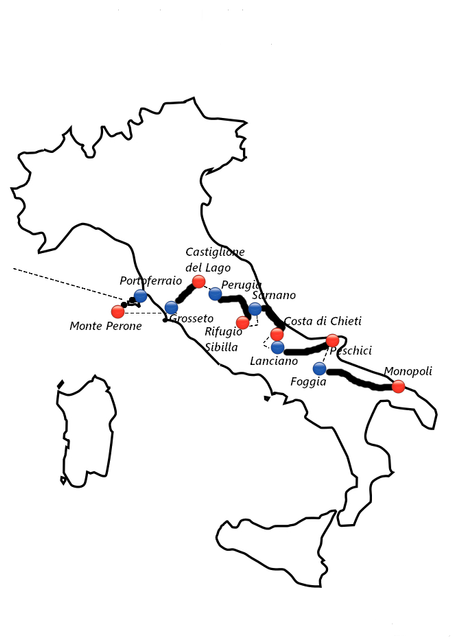 The 7th stage is an individual time trial that represent the border crossing between France and Italy. Note: The practicability of the roads has been verified either through direct knowledge or via street view, as well as with the editor in driving mode. Some dirt roads are not completely tracked by street view, and to evaluate their practicability the following rule has been used: if the road was practicable as far as the images arrived and it was feasible even after the interruption, it was considered entirely viable, otherwise it was discarded. Tipical sprinter stage in the heart of France, with just a 4th cat. climb to assign the first mountain jersey. Nice stage for stage hunters and athletes like Kwiatkowski or Sagan. The last 80 km are a thrilling up and down in the bourguignon hills and the last cote tde Hauteville has a 1 km white road sector. First battle between the GC leaders. Two 1st cat. climbs before the last slopes to La Font d’Urle in the Vercors region. Short transfer to Gap and then road to Drauguignan trough the hearth of Provence region. The sprinters can suffer in the final Cote de Figanieres (3km at 7,2%). This can be an opportunity for stage hunters. Typical Paris-Nice stage with several half mountain passes and the classical Col d’Eze in the last km before the dive down to Nice. The beauty of French and Italian rivieras will be the perfect corniche for this first TT stage. Pay attention to the wind! Hilly stage in the first half with Nostra Signora della Guardia and Passo del Bracco, but the last 80 km should allow the sprinters to be the main actors in the finish line. Last opportunity for sprinters. The hill of Montefalco can represent a springboard for stage hunters that can try to anticipate the sprint. The last km. is slightly uphill. 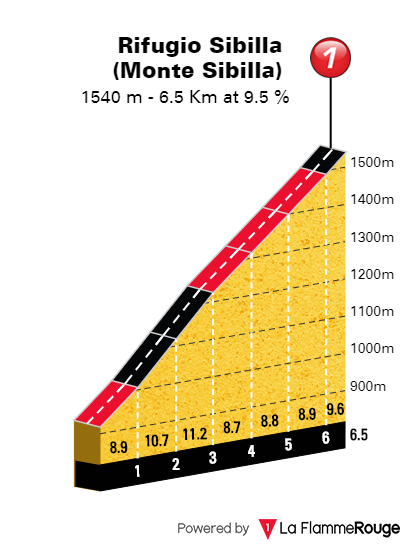 Possibly the hardest stage of this tour won’t be a high mountain stage but this legs-breaking medium mountain stage with 20 walls to climb in the Marche region. Not a single meter of flat to finally reach the terrible gradient of the Montelupone wall. Last edited by pierluca.ferretto on 27/02/2018, 12:22, edited 1 time in total. A prologue through the small cobbled streets of Montmartre. Challenging & technical in a beautiful setting. A first chance for the sprinters to shine and to possibly take the leaders jersey if their prologue went well. A bit of an Ardennes classic vibe in this stage. The hill specialists should like this one. The final climb isn't the hardest, but the stage should be hard enough to start that climb with a smaller peloton than usual. 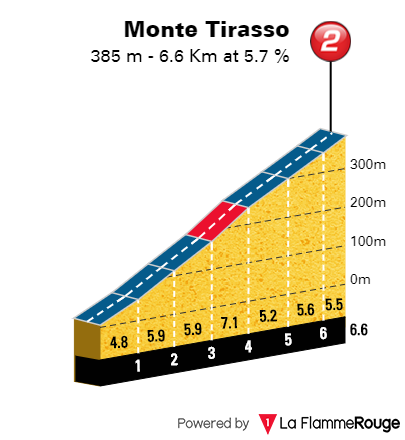 A possibility where an early attack in the stage might make it to the end. 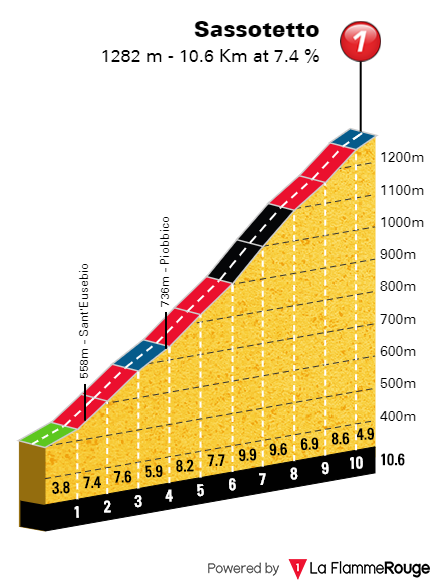 A sprint where the favourites for Milan - San Remo will be on top will probably be the result of this stage. If you can't make it in the front on the côte d'Aleyrac, you'll need to get in form quickly for the Primavera. A crucial stage for the GC. Long and lots of climbs with a classic finish. Luckily for some, the climbs themselves aren't the longest, so riders who prefer hills to mountains could still hang on and save their GC. A flashback to stage 5. The final climb is tougher, but a bit further away from the finish line. Another chance for the riders who are hoping for a sprint on the Via Roma. Sprinters who were dropped on the climbs the last few stages have a chance to make up for it, right next to the leaning tower. 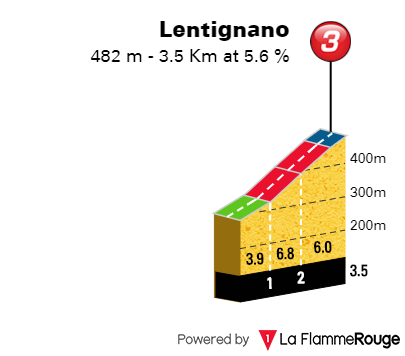 A very interesting final: the very hard Croce di Lignano, followed by a hill sprint. An attack on the Croce could make it to the end or completely fail. One for the daring and the final chance for the hill specialists. A mountain stage with a tricky finish. Dropped riders on the Monte Prata can make up some few valuable seconds in the end. An extremely short stage around Ascoli. GC riders who are focused on climbing have to make their move here. The last chance for sprinters and the final head-to-head race before the Primavera. An upgrade in difficulty for the traditional ITT in San Benedetto del Tronto, making a possible close GC extremely interesting. No, there is no space for the finish.